This product is intended primarily for mobile device users requiring a more accurate and directional microphone than the on-board microphone and is compatible a variety of operating systems, including Windows, Mac (if interfacing with a USB adapter), iOS and Android. This is the same microphone included with the recently released (October 2015) TravelMike bundle, so for those with the older bundle which included the short boom microphone, switching to this element will bring you the same performance of the updated TravelMike. 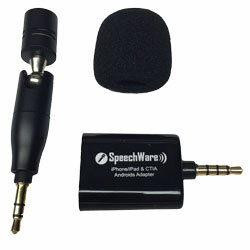 The small mobile device adapter bundled with this product is designed for situtations in which the TabletMic is plugged into a port that combines microphone-in and sound-out functionality, such as seen on most mobile devices and many newer computers. It serves the purpose of separating the mic-in and sound-out channels. Why the TabletMike? To be blunt, this is an expensive accesory. Why should you consider it? To very important reasons for the user requiring the best performance from an application on a mobile device: 1) it is a high-quality microphone element that can be expected to provide a better audio signal than the on-board microphone and 2) it is highly directional and will likely do a much better job in rejecting external noise outside of the axis of this device. If "hearing is believing", take a listen to the two following links, recorded within minutes of each other on the site owner's iPhone. Both recording are done with moderately loud music playing in the background. One is done with the on-board microphone and the second with the TabletMic. You decide which provides the best noise rejection. Our Take: Like everything from SpeechWare, this is beautifully engineered, performs amazingly, and is expensive! We consider this a perfect device for the mobile user doing mission critical dictation on a mobile platform. From Susan Handelman of San Rafael, California on 9/19/2016 . I upgraded to this mike after buying the previous version a year ago for my laptop and travels. I was not sure it would be worth the extra money, but it definitely is!! A big improvement. As good as my Speechware table mike. From Anonymous of Windsor, Ontario on 5/8/2016 . From Anonymous of Oberlin, Ohio on 4/30/2016 . The set up is similar to my existing tableMike, but the footprint is smaller and possibilities for use attached to the portable computer or attached using the mike as a hand-held seem more flexible. The accuracy seems similar. From Trueblood of California, California on 11/1/2015 . Just upgraded from the "flex" body mike to the new style. In a word fantastic! 9/18/2016 – Is this module identical to the top/microphone part of the SpeechWare travel mike? Response From Speech Recognition Solutions: Yes, the TabletMike uses the same microphone element as the TravelMike. The TabletMike also includes an adapter for use with iOS and Android devices, which the TravelMike does not. The TravelMike on the other hand, includes several items that are not part of the TabletMike set (SpeechMatic USB Multiadapter, 90 degree adapter, 6" USB extension cable).